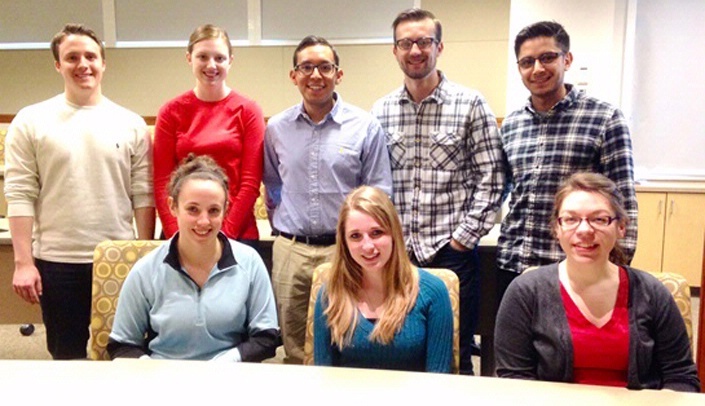 Among the students attending the conference are: From left, back row: Drew Dickson, Amanda McIntyre, Daniel Agraz, Peter Woolman, and Rohan Khandalavala; and from left, front row: Natalie Harmon, Stephanie Nitz, and Megan Gunderson. Fifteen UNMC students from the UNMC SHARING Clinics will be attending the National Society of Student-Run Free Clinics (SSRFC) Conference in Atlanta this weekend. Eleven students will be presenting at the conference. Incoming co-presidents Sarah Johnson and Carl Post, along with UNMC medical students Brian Coburn and Josh Gruhl, who are currently on the National SSRFC Board, will be joined by these presenters. Peter Woolman & Amanda McIntyre - "Outline of Continuity of Care Program at UNMC SHARING Clinics and Effect of Follow Up Phone Calls on Patient Attendance." The presentation is on the program implemented to call continuity patients between appointments to increase adherence. Drew Dickson & Daniel Agraz - "Compliance with the American Academy of Ophthalmology Guidelines for Routine Eye Examinations in the SHARING Clinic Patient Population." The presentation is on assessing patient adherence with the national ophthalmology recommendations. Stephanie Nitz - "Avenues of Student Involvement Outside the Clinics: Sub-committees of SHARING." The presentation is on the committees used for the SHARING board. Megan Gunderson & Natalie Harmon - "An Interprofessional Guide to Laboratory Testing for Student-Run Free Clinics: Reference Guide to Sexually Transmitted Infection Diagnostics and Monitoring." The presentation is on creating a procedure document for how to tackle lab needs at the RESPECT clinic. Austin Dudzinski & Rohan Khandalavala - "Successful Fundraising Through Collaboration: How the UNMC SHARING Clinics Fundraising Committee Meets Goals through a Unique Partnership with the Nebraska University Foundation, UNMC Office of Business and Finance and Office of Public Relations." The presentation is on SHARING's fundraising operations. Jenalee Schwab & Daralyn Morgenson - "Online Diabetes Training Module for Health Professional Students Prior to Participation at a Student-Run Clinic." The presentation is on creating a tutorial on educating student providers on how to treat diabetic patients at SHARING Clinics.